A short five day vacation trip to Mexico is just what I needed to seek refuge from another Chicago winter. Who knew it would be a mild March, although truth be told, I did manage to miss a small snowstorm. 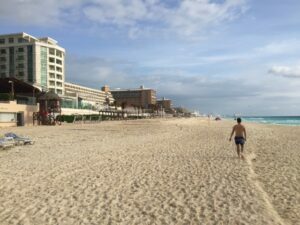 A beer procured from an airport hawker at near US prices was ideal for the slightly warm, balmy day, and the seventy-five minute ride south from the Cancun airport. 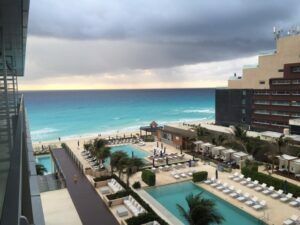 The mostly modern highway leads past a number of resorts, with names like Excellence Riviera, Iberostar, Xcaret, and Xel-ha. Interspersed among the mangrove and a few small towns, including Puerto Aventuras, Akumal (where the development of the Rivera Maya began in the 1960’s,) and Playa del Carmen, were quite a few familiar names like Walmart, Office Depot, and the ubiquitous Starbucks. One of our guides would tell us jokingly, I assumed, that all the American franchises were thriving in Mexico, except one…Taco Bell! 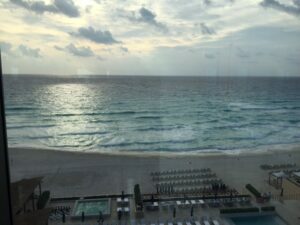 Finally, we reached the outskirts of Tulum. It is a municipality of just under twenty thousand people, located near the archeological ruins of the same name. That is where The Grand Bahia Príncipe is located. It is one of several resorts dotting the Caribbean as the coast winds southward toward the ruins. This huge property is comprised of four resorts in one. Akumal, a 758-room, high end all-suite resort, that was off limits to us; the Sian Ka’an, a contemporary, modern resort, for adults only, featuring a golf course and 420 rooms; Coba, the largest on the property, with 1080 rooms, and a more family oriented place; and lastly Tulum, named after the nearby ruins, and where we were staying in one of its 960 rooms. We also would be enjoying its three pools, five restaurant, and seven bars. Add to that, the additional six pools and thirteen restaurants and bars we could theoretically go to, and there is no shortage of things to do. Each resort area within the complex featured a spacious lobby, which was a mini beehive of activity. Dozens of people congregated. Some were checking in, several were in the process of checking out, but most were gathered to get their free wifi. The receptionist checked us in and unfurled a map that showed us where not only our room was, but where the restaurants were, including a 24-hour cafe where we could snag a late lunch. The map proved very useful as the rooms were in three story villas, all of them looked alike, and numbered around thirty. There are staffers everywhere, and our luggage and tired selves were escorted to a second floor room at one of the closer buildings. All the villas fan out from the lobby, and are groups of six or ten units forming and inverted u-shaped configurations. It was already past four and we walked over to the aforementioned cafe for a very late lunch. There were a surprising number of food choices available, well beyond the requisite hamburgers and french fries. That included salads, fish, and poultry. There was also a soft serve ice cream machine, and a stocked bar serving margaritas, daiquiris, and mojitos. Many guests had their own large cups to keep the frozen concoctions cold. We also checked out the pool area, one of several on this part of the property. Lastly, we took a stroll by the beach. It was a windy day, and the red flags were flying, indicating high surf or strong currents. That didn’t seem to deter the few people who were in the water, which was protected by a small barrier reef. Our room was quite ample, and included a king sized bed, a couch, a small round dining table, as well a refrigerator stocked with Corona beer and soda. The room was no smoking, and yet ironically, there was an ash tray on the balcony. After a brief rest, and despite having had a snack so recently, we set off for dinner a mere two hours later. The theme at the main dining room was Spanish. The room was decorated in the red and yellow colors of Spain. There were Castellan food options, such as paella, although I chose more typical Mexican fare, like arroz con pollo (chicken with rice.) The food was fair, but the choices were many. After dinner we went to the adjacent bar. The entertainment included a male and female duo on vocals and drums, backed by synthesized guitar and keyboards, courtesy of their laptop. The repertoire consisted of seventies dance hits. After they finished their forty-five minute set, we were entertained by a Mexican Elvis impersonator. He was backed by a full six piece band. Even though he mispronounced a few lyrics, his enthusiasm and schtick more than made up for it. Day Two began with a walk over to the Coba. 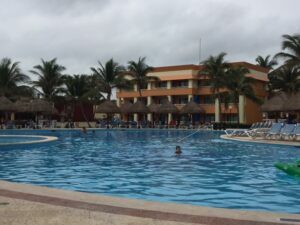 This resort features baby, kids’, and teen clubs, a water park playground, kids’ menus, and family suites. There are numerous, frequent trams ferrying guests all over the property, to and from the various sections, but this was our morning exercise, so we circumnavigated the Coba, finishing at one of their restaurants for our breakfast. We were greeted with our choice of adult beverages at the restaurant, and I opted for a Bloody Mary. It was made from scratch. The coffee was good, and served with warm milk. The best part of the meal wasn’t the hot entrees, it was the abundance of tasty, fresh fruit. The remaining part of the morning was spent poolside, before breaking for lunch at the Brazilian restaurant. Unfortunately, It began to rain after lunch, which meant there wasn’t much more to do, than checking emails or texting with family, while my wife contacted her office. This was a working vacation of sorts. As a travel agent, there is always something to tend to back home. On this night, Mexican was the dinner theme, so I feasted on ceviche and bistek (a traditional skirt steak) among other entrees. At a friend’s suggestion, we booked an excursion to the Mayan ruins at Tulum. For a mere $35 each, we procured a guided tour for the following morning. It would be an early start so we kept things low key, and retired early without attending the evening show. Day Three: Along with several other people from our resort, we boarded a coach bus for the twenty minute trip south. 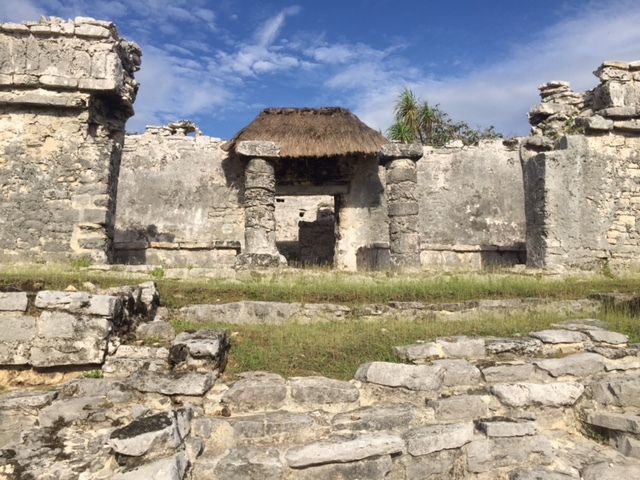 Tulum is one of the more recent Mayan architectural sites, and the only one located along the coast. It was actually the first site discovered by the Spaniards back in the 16th century. From the parking lot it was a 600 meter walk to the site, but first we passed a gauntlet of vendors, sandwich shops, bars, and a Starbucks. Once we cleared the man made trap, a walkway took us past mangroves, palm trees, and other dense foliage to the stone wall that surrounds Tulum, whose origins are estimated to date back 1400 years ago. I’ve never seen the better known Chichen Itza, but Tulum was spectacular in its own right. The area is open space dotted with the remaining temples and the foundations of ancient houses. The site was mostly a fortress built to defend the coastline. It culminates in a lighthouse atop a cliff, that overlooks the ocean. Several buildings are positioned to funnel the sunrise light at the vernal/spring and winter equinoxes, in a sort of architectural calendar. After a walking tour by our guide, we were free to explore more, and more importantly, decent the wooden staircase to a cove and go swimming in the waters of the Caribbean. We were among the first groups to arrive at Tulum. By the time we finished swimming, the place was crawling with tourists. Despite the influx of people, it never felt crowded on the grounds. We returned at lunchtime, and decided to seek out the Mexican restaurant on the property for for the day’s lunch buffet. It was one of the better lunches we had, with made-to-order pasta, spinach wrapped in chicken, cucumber salad, and yes, shots of tequila. 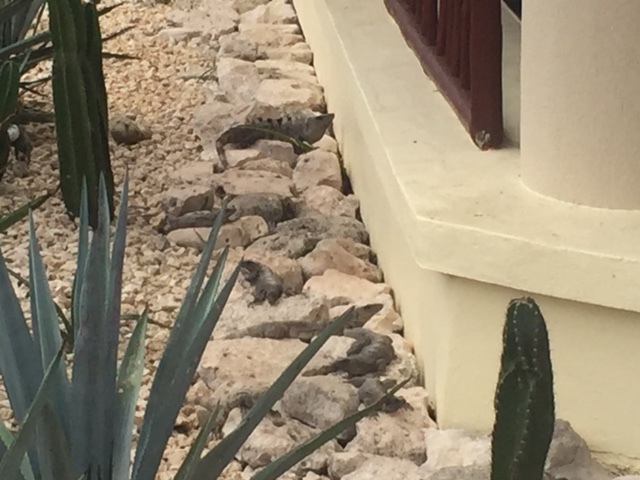 We saw an army of iguanas sunbathing on the rocks just outside the restaurant. Then it was a brief pool time and relaxing before our a la carte meal at La Tortuga, the property’s Brazilian Steakhouse. 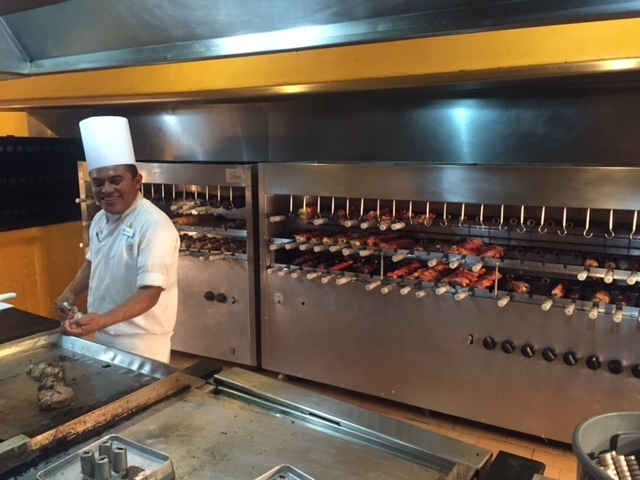 I’ve eaten that type of meal before and it’s always a challenge not to load up on salads and appetizers before the arrival of the passadores, he waiters holding sharp knives, carrying meat on sword like skewers used to prepare meat in the churrasco style of South American rotisserie cooking. We dined on lamb, steak, chicken, and grilled vegetables. My one small gripe about the service, is that while the staff are very nice, they couldn’t seem to refill the water and drinks on a regular basis. Almost all of them could converse in English, and if not, may Spanish was sufficient to ask for what we needed. The evening’s nighttime entertainment was a Michael Jackson tribute show. The star lookalike lip-synced and mimicked Jackson trademark moves along with a troupe of eight dancers who choreographed routines to Jackson’s more popular songs. After that we proceeded to the bar where the staff found four couples willing to participate in some very silly, but entertaining dance games. That was enough amusement for one night. 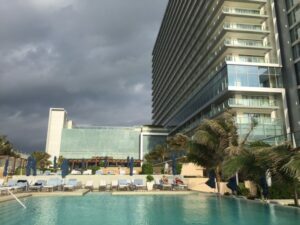 Then we braved a tropical rainstorm and some slightly flooded street for the hour trip north to Cancun, where our final destination, Secrets the Vine, awaited. Cancun reminds me of Miami Beach, with a narrow strip of land abutting the mainland. High rise hotels shoot out of the land, gobbling up nearly every inch of buildable space. The weather continued to be windy and rainy, so that precluded us from exploring the pool area Instead, we went to see how many of the restaurants we could scope out. The Italian eatery came highly recommended, and we ended up there. Along the way we got a tour of the spa, booked a massage, had a latte in the coffee and snack bar, and staked out a place while watching the Duke – North Carolina game at the sports bar. A small crowd gathered there to watch a UFC fight card . While we waited for our table at Nebbiolo, we chatted with Uriel, whose job was to make the pizzas, and prepare the focaccia bread. That included rolling the dough, and baking the pizza crusts in an 600 degree oven. He deftly maneuvered his creations in and out of the device without any worry of getting burnt. 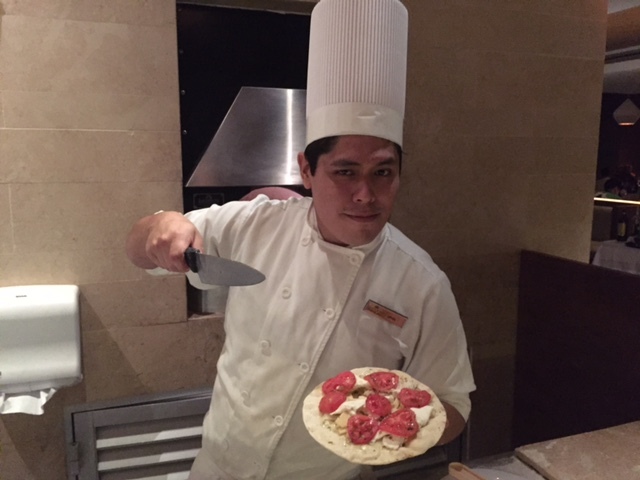 Uriel’s says he makes about seventy pizzas a day during his his twelve hour shift. He even made a version of my favorite appetizer pizza, the four cheese and tomato pizza, which we were all too happy to share with two ladies seated next to us. Day Five broke with a mix of dark, rain laden clouds with a few specks of sunshine. Despite a howling wind and a pounding surf, a handful of people were out on the beach at eight in the morning. The red warning flags were once again flapping in the stiff breeze, and no one seemed to be in the water. A few brave folks were poolside, but abandoned that idea after a while. Yet in spite of the pounding surf, the water color remained a gorgeous turquoise blue. Every vacation, it seems, my wife makes at least one attempt to kill me via the long strenuous walk. This trip was no exception. We passed on the gym to go for a walk on the beach. The clouds were a mix of grays, light and dark, but did not seem to imply that rain seemed imminent. We headed north up the beach, along the ocean front, into the face of a stiff breeze. The wind was causing the waves to break on shore, and being low tide, there was a wide expanse of sand between the hotels and the water. Unfortunately, the sand was very loose and with each step our feet would sink a little bit into the sand. It wasn’t like walking in quicksand, nor was it like treading on the hard packed stuff either. Undaunted, off we went slogging through the slippery sand, trotting onward, past more high rise hotels, and larger, low rise properties. We got perhaps a mile up the shore, when some more ominous looking clouds began to approach the coast. Although it would have been just a little further to our desired endpoint, I recommended we turn around. With the head wind gone, we could move at a better pace, but it still was a bit of a battle to keep moving forward in the sand. I was dripping sweat by the time we got back to the hotel, a two-mile roundtrip according to my wife’s fit bit. Ironically, she was the one dying of thirst as we proceeded directly to the breakfast buffet. The sun finally made an appearance, and we spent the morning poolside. It was pretty easy to find some chairs, where we sat next to another couple from Chicago. We grabbed lunch at the Sea Salt Grill, where I had a very tasty salmon ceviche and gazpacho. They are very creative with their takes on traditional South American fare here. For the afternoon activity, we had previously decided to indulge ourselves and splurge on massages at the spa. But before that, I spotted one of the entertainment crew members holding up a sign that said “Texas Hold’em Poker.” That is like catnip for me. Three other participants and I played, and in less than an hour, I was sixty dollars richer. That was good, because I was due at the spa. We arrived early, and took advantage of the sauna, steam room, cold pool, and jacuzzis, before heading to the “relaxation” room in advance of our treatment. I opted for the fifty minute Swedish massage. That was relaxing enough to take care of the rest of the afternoon. 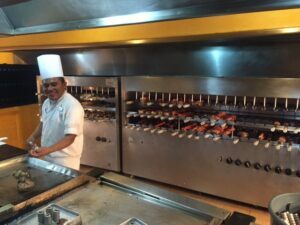 That night we headed up to the Olio restaurant, the hotel’s middle eastern eatery. JJ, one of the maitre d’s at the Italian restaurant from the night before, had not only urged us to try Olio, the Mediterranean themed restaurant, but promised to get us a reservation. What we didn’t know, was that JJ had procured one of two “feature” tables with a gorgeous nighttime view of the the Cancun hotel district skyline. All of the menu choices looked fabulous, so we ended up getting a sampler of hot and cold appetizers to go along with our entrees. 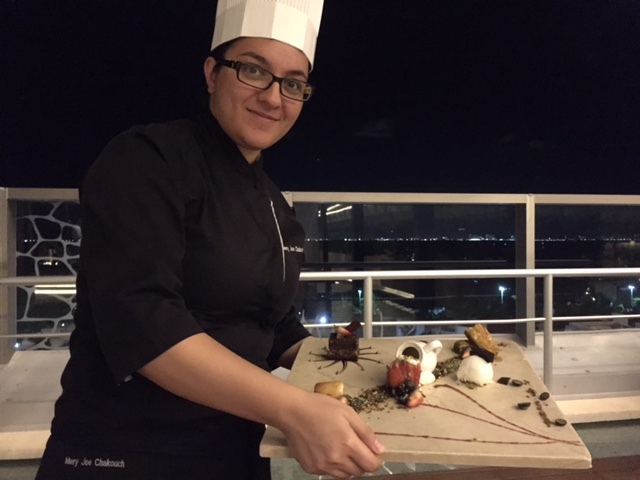 As a bonus, the chef herself presented us with a desert sampler that was as much a work of art, as it was delectable. I’m not a big fan of people taking food pictures, but this one had to be seen to be believed. 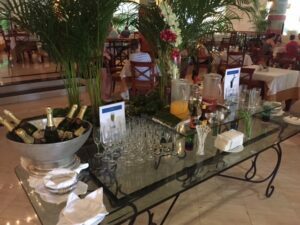 We went down to the lobby and out towards the beach to walk off some of the food, and enable my wife to reach her 10,000 steps for the day. We made a detour via the game room and played ping pong, something I haven’t done in quite some time. My wife comes from a family of avid racquet sports players, but we just played a few minutes without keeping score. The hotel game room also had air hockey and foosball tables, plus some video game consoles. Lastly we stopped by the piano bar, where no one was playing piano, got a night cap and retired for the evening. Day Six After so much food, we resolved to hit the gym. This was a very impressive facility indeed, with lots of treadmills, bicycle, free wights, exercise equipment, and or course, ellipticals. This room had an ocean view that would make me want to go exercise every day. We followed it with another tasty breakfast, hung out on the balcony watching the activity below until it was time to get our taxi to the airport. Cancun’s airport is more modern than some US airports. In addition to the world’s largest supply of tequila for sale, it boasts a number of American franchise restaurants, such as Burger King, Dominos, TGI Fridays, Bubba Gump, Johnny Rockets, Margaritaville, and of course Starbucks. So you travelers can get a little taste of home, before actually hitting US airspace.